Our IDAK Ministry Advancement Assessment is for ministry leaders who are seeking an alternative ministry from what they have been doing or for those who seek to transition into a marketplace career. Our range of ministry positions exceeds 20,000. We test not only your interests, talents and values, but also your temperament strengths. We can also search for the best matches among over 40,000 marketplace careers based upon your preference. Our testing provides a complete list of your aptitude strengths, your top 10 recommended ministry/career options and the IDAK Employer Search Guide. The Employer Search Guide helps you locate ministry organizations which match the report results as well as marketplace organizations in your city, state or nation. The IDAK Ministry Advancement Assessment can be oriented specifically for adults desiring a transition into greater or full-time ministry service. For many adults, after the responsibilities of raising their families subside, they seek to make a greater impact in people’s lives. This system has helped literally thousands of people of faith take their existing passions, vocational strengths and God-given talents and transfer them to a meaningful ministry in a church or ministry organization application. Our range of ministry positions exceeds 20,000. We test not only your interests, talents and values, but also your temperament strengths. Counseling is provided over the phone or in our office in two, 90-minute sessions. 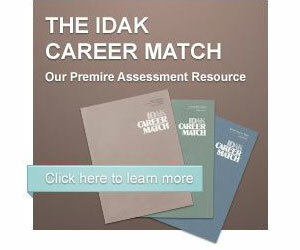 You receive a complete list of your aptitude strengths, your top 10 recommended career options and the IDAK Employer Search Guide. The Employer Search Guide helps you locate ministry organizations, which match the report results, in your city, state or nation. This service is recommended for any individual 45 years of age or older.